Alexa is an Amazon product. It's a amazon web company which allows you to check your website's global ranking and country specific ranking. Alexa shows the ranking of each and every website which comes under 20,000,000. It shows your website's ranking after measuring a lots of factors such as page views, traffic, keywords ranking and much more. You might have observed that Alexa doesn't start showing ranking until your site has gained enough web traffic. Alexa is the only website which tell that where your website stands globally. At the initial stage it only updates your global ranking but once you started gaining enough traffic from other countries then it will update your rank for each and every country. In one of my previous article I covered some seo factors which can affect your global ranking. 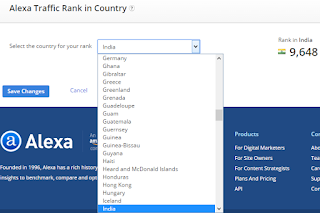 If you want to know your website's rank then simply do a search on Alexa and then it will show your all over world ranking and ranking in a specific country for example say your website is from India then it will show global ranking along with rank in India. If your website fall under 100,000 then Alexa will show ranking of other countries too. It can update a maximum of 30 countries ranking. But what if you want to know your site's Alexa ranking for other than these 30 countries? My friend you can't get it on any other website or by directly searching on Alexa search. Relax and site back, Here's a trick to find out Alexa ranking for particular each and every country. Follow the steps mentioned below in order to find Alexa rank for specific country. First of all you sign up for a new account on Alexa. Click on "Sign Up" button on the top right corner. Choose any paid service or go for a free account. You can get 7 days free trial from Alexa. Choose free trial service if you don't wanna pay at starting. This is the second step which is must to appear your Alexa ranking for the first time. Just upload the HTML file to your website's root directory and add Alexa meta tag to the header of your site. Once your ownership is verified you are free to add description of you website and all other details. Alexa lets you put 2 links also just below your description but for this you need to choose a upgrade plan. Login into your Alexa account. Choose your website and navigate to Site Management>>edit Site Listing. Scroll to the end of the page now here you will see Alexa Traffic Rank In Country. Here is a list of over 200 countries to choose from drop down menu. Go and check out your website ranking for some countries and start increasing your Alexa ranking. So this was all about how to check your website rank for particular country. To get benefit of this feature you need to sign up on Alexa as according to terms & conditions this ranking checking factor is not available publicly. If you have any doubt or query then feel free to leave a comment below in the comment section.